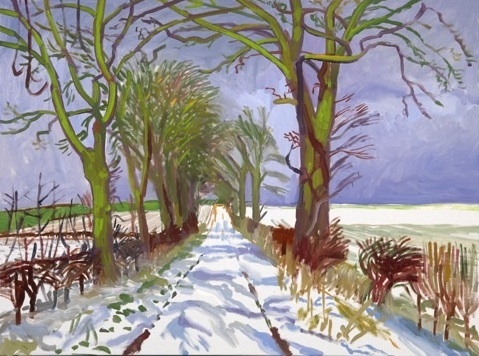 David Hockney is your archetypal large-scale, pedal-to-the-metal sort of artist. His output is prodigious in quantity if irregular in quality. Either way, it shows the working of a systematic and quick-witted painter. These two qualities go together: the system enables the quickness. There were many examples of how this works in “David Hockney: A Bigger Exhibition” now nearing the end of its run at the de Young Museum in San Francico. This self-portrait watercolor demonstrates the quickness. What makes it sing is the liveliness of its shapes. Three blue background shapes, all different; three varied black shapes; red suspenders, one thin, rising almost nervously, almost-but-not-quite straight to the ear, the other fatter, curving smoothly out to the shoulder; the yellow pants, not repeating but echoing the warm tones of the face; the face, sharply delineated by the black shirt, modeled in two tones, and the gray hair in four, echoed by the third-gray glasses; the eyes, intenser shades of the blue surround that prevent the face from bouncing out of the picture plane. 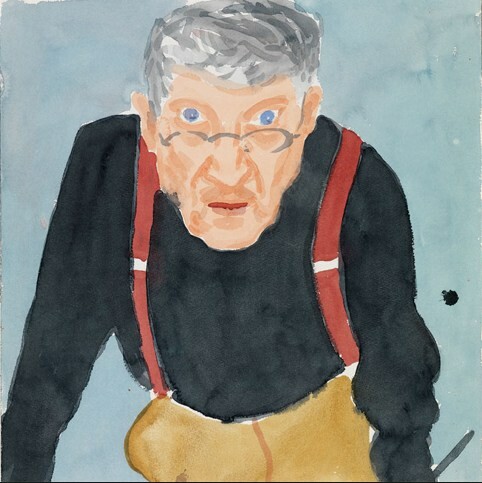 Face and hair are the only overtly modeled shapes; for the rest, Hockney relies for visual action on slightly wandering, washy paint rather than background details or textures. He also doesn’t draw tightly: the eyes are pretty firm, but the tones of the lower part of the face wander. So: everything straightforward, but knowing and immediate, even at some cost of precision. His best landscapes are more elaborate, but similarly methodical. The sky is laid in first from side to side in short, streaky strokes of several closely-related blues. Then the low green band of background forest, again from side to side. The foreground gets more complicated, but the red band appears intermittently, and the purple path shapes enfold the middle distance like loving arms. The foreground shapes are laid in. Then the principal tree trunks, very directly over the sky in big, wet strokes. Then smaller trunks and branches between, brushed in until they almost hit larger, nearer shapes, but don’t quite hit them. Then modeling on the larger forms such as the trunk to the left and the ground shapes, which enlivens those shapes, and by dabbing colors around ties them into the rest of the composition. This process continues from large to small, elaborating, touching in, seldom if ever changing or correcting, until the point of compositional repletion is reached. This process builds the sense of receding forms because you can see that this one is behind that one, while at the same time emphasizing the flatness of the picture plane because you can see that the background shapes lie right together with the foreground shapes. Hockney’s device of breaking a piece up into abutting canvases—in this case, six—divided by frame strips reinforces the flatness, and further prevents the eye from getting lost in pictorial depth. Descriptive though it is, the eye settles on the pattern, the abstractness of it. In the Winter Tunnel the process is similar, but the colors are pushed: the blues of the sky, reds of the bushes, greens of the trees. The bright, unshadowed snow is the white canvas simply left untouched. Hockney revisits the same motifs repeatedly. His sitters are individuals, but handled in the same way, as a basic, interesting shape with variations; his landscapes will have different seasonal colors or changing foliage, but essentially the same composition for piece after piece. This is a virtue in his work, not a weakness. He can treat his subjects so swiftly and assuredly because in working variations he knows pretty well where he is going before he starts. His quick eye for elegant shape and delightful pattern enables him to pull each view off without fumbling or hesitation. We are watching a performance rather than an exploration.